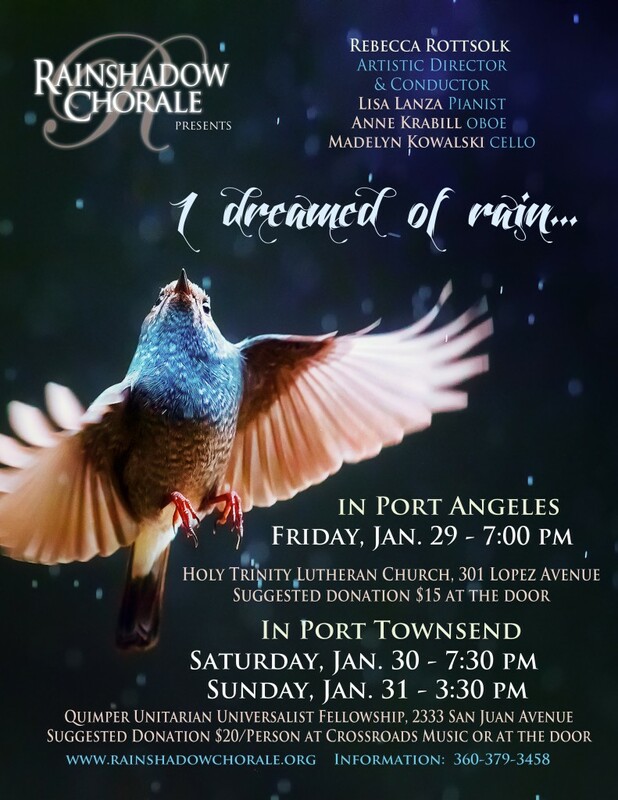 Rainshadow Chorale presents…I dreamed of rain…. RainShadow Chorale’s concert, “I dreamed of rain…,” expresses the power of peace—both within ourselves and in our communities. A centerpiece of the program is “The Peace of Wild Things,” a poem by Wendell Berry set to music by Jake Runestad, an emerging star in American choral composing. Other numbers feature musical settings of poems by Sara Teasdale and Langston Hughes, among others. The concert title derives from a piece that expresses the essence of the program. When the music for this performance was chosen last year, Washington was experiencing a drought, and people really were dreaming of rain. In this wetter season we can hear themes of forgiveness and harmony that engender peace among people and nations. At a time of national and world conflict, this message is more important than ever and sets the tone for our hopes in the new year. Through its uplifting and engaging performances, RainShadow introduces audiences to diverse repertoire by composers old and new as well as performance styles from other times, countries, and cultures. RainShadow Chorale strives to create an environment that enlivens the role of choral music on the Olympic Peninsula. Anne Krabill holds the title of principal oboe of the Port Angeles Symphony Orchestra, the Port Angeles Chamber Orchestra, and the Port Townsend Community Orchestra. In addition, she has performed as principal oboe with the Northwest Symphony in Seattle, the Bainbridge Symphony, the Peninsula Dance Theater in Bremerton, and the Sooke Philharmonic in British Columbia. She was also a guest performer with the 82nd Airborne Division Band in North Carolina. She is a native Canadian and received a Bachelor of Music from Mount Allison University. Her oboe studies continued in Stuttgart, Germany, with Gustav Steinert and in London, England, where she won a scholarship to study with the legendary oboist Leon Goossens. Prior to moving to Washington, Anne was the principal oboist with the Atlantic Symphony Orchestra in Halifax, Nova Scotia. She taught oboe and chamber music at Dalhousie University and performed frequently for the CBC with the ASO and as a soloist and chamber musician. Anne and her husband, David, a bassoonist, own a reed manufacturing business and sell oboe and bassoon reeds internationally. Kowalski, a homeschooled junior, lives on Marrowstone Island. She has been studying cello for nine years, and travels to Bellevue weekly to take lessons from Leslie Marckx. She recently placed first in the 2015 Port Angeles Symphony Young Artist Competition and was a finalist in this year’s Seattle Young Artists Music Festival, performing Tchaikovsky’s Variations on a Rococo Theme in both competitions. In February 2013, Kowalski performed the first movement of Boccherini’s Concerto in B-flat Major with the Cascade Symphony as the winner of its Rising Stars competition.